You might be expecting a humor piece — “I once dropped a piece of Parma ham onto my lap, where it draped across my leg as though it were a patch on my pants, just like Lady Gaga’s famous meat dress” — but I’m actually quite serious here. I’m not really a Gaga fan, no “Little Monster” as she calls them (effectively creating a “brand” of her own fan-base). I’ve seen one Gaga concert on TV, I’ve heard the hits on the radio. It’s catchy stuff, perhaps not my cup of tea, unavoidably sticky. But she’s clearly a real musician, versatile, skilled, committed. And I learned some things that surprised me. Let’s start with the tattoo. I don’t have one and never will; but if I did, I would be very likely to choose a line from the poet Rainier Maria Rilke, whose life and work I have studied intensively, resulting in one album of his poetry set to music. I even wrote a one-man musical play, based on his early life and letters, and performed it exactly once. Then there is her approach to art and work, which one might call “Rilke-esque”. She lives her performance, 24/7. She is fully committed. She professes not to care about making money, and in fact went bankrupt last year — despite her enormous success — because she invested her own money in re-designing and re-tooling her tour, continuously, in response to her evolving sense of what needed to be done. Without going into the philosophical details here about why, it should be obvious to anyone observing that I have for many years taken a similar approach to my work, at a much, much, much smaller scale of operation. (Just trying to make sure you know that I have no illusions of grandeur. My blog posts are read by, oh, several dozen people at the moment!) In fact, I used to conceive of my work as a kind of “global art project.” These days, I no longer make any distinctions between my “artistic” life and my “professional” life. Consulting on sustainable development strategy, writing, developing processes that bring people together to make change, making up songs and singing them to live audiences as part of a speech or a training session — even knowing when not to sing, because the role I’m playing and the purpose I am dedicated to achieving requires near-absolute adherence to the traditional cultural patterns of suit-and-tie and professional decorum — these all blend together now. It’s not like I’m doing everything all the time, however. Sometimes a corporate client will specifically ask me to bring my guitar to the session on sustainability strategy (I have even sung to audiences of scientists, and military personnel, you-name-it). But sometimes, it is obvious that any hint of being a “creative person” should be left outside of the meeting. By the same token, when actually performing as a musician, I tend to leave the bullet points on strategy off the stage. So, work, art, life … It’s all one thing. Sometimes it’s serious (e.g. working to help a country or a company fine-tune its sustainable development strategy), sometimes it’s just plain fun (e.g. 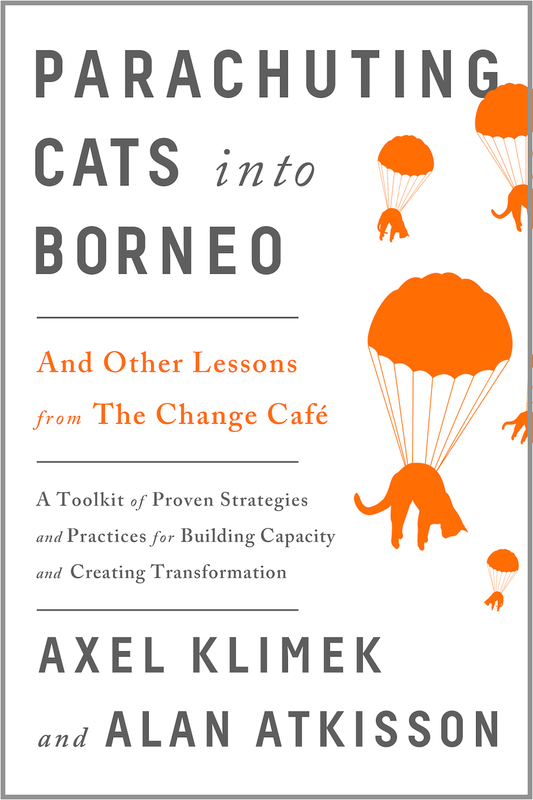 singing the “Parachuting Cats” to an international conference audience). It’s not about “saving the world.” It’s about being *in* the world, as it is, in this particular moment. Okay, let’s wrap this thing up on a lighter note, with the tiniest grain of potential truth in it. When I was a musician in New York in my 20s, I used to get my hair cut on Manhattan’s Lower East Side, at the same place Madonna used to go to, before she got famous. And Lady Gaga, this generation’s Madonna, also comes from the Lower East Side. So who knows — maybe all three of us have a hair-stylist in common, too.